Here's Jane in Montana with her friend Chinook, who is not young, but is still quite good-looking and very reliable. Editor's Note: My friend Jane was telling me about her trip to the Pine Butte Guest Ranch in Choteau, Montana the other day and it sounded so interesting that I asked her to write up some of her thoughts for Clever. There are still bears in California, but they are black bears, not grizzlies. There used to be grizzlies here, but the only ones left now are the ones on our state flag. We'd have to go north to Montana, Canada or Alaska to find grizzlies these days. One of the questions most often asked about bears is: How can you tell if it's a grizzly? It's not the color of their fur, it's the size of their claws. 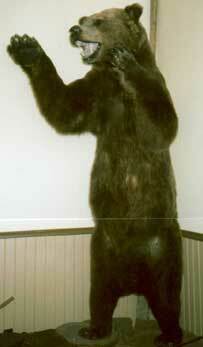 Jane took this photo of a black bear from a bearskin hanging on the wall at the Pine Butte Guest Ranch. Notice the small claws at the end of its paw. They look a bit like dog claws. Now, see the difference between the claws. 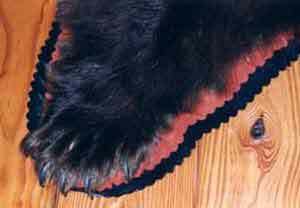 This is from a grizzly bearskin. Bear: any large, stocky, omnivorous (this means that it eats both plants and animals!) of the carnivore family Ursidae (which includes black bear, brown bear, polar bear, sun bear, and sloth bear), with thick coarse fur, a very short tail, and a plantigrade gait (well this means it walks on the entire sole of the foot, like humans and bears! ), inhabiting the northern hemisphere and northern South America. Black bear: a medium-sized bear, Ursus (Euractos) americanus, of wooded areas, ranging from gray to black in color and having a straight brown muzzle. Brown bear: any of various tan to near-black bears of the species Ursus arctos, having an upturned muzzle and a hump high on the back: subspecies include the brown bears of Eurasia and the grizzly bear and Kodiak bear of North America. Grizzly bear: a large North American brown bear, Ursus arctos horribilis, with coarse, gray-tipped fur; now restricted to interior Alaska, western Canada, and the northern Rocky Mountains in the US. Teddy bear: a toy bear; esp. a stuffed one, after the names given to two bears in NY Times cartoons comically depicting the bear-hunting exploits of Theodore (Teddy) Roosevelt. The editor snapped this photo in a small museum in Skagway, Alaska. It's a very big grizzly bear. Look at the claws! Other interesting facts about the Brown Bear: Its physical statistics vary tremendously, but generally speaking, the adult brown bear is 3-1/2 feet tall on all fours and its body length is between 6-1/2 to 7 feet. Adults weigh between 330-825 pounds on average. Males weigh roughly twice as much as females. Some individual males with access to coastal areas can weigh as much as 1,500 pounds. Bears live approximately 25 years and they have two occupations, they are either hibernating or eating. They love veggies ~ plant life, fruit, berries and honey. They occasionally eat decaying animal carcasses, fish, insects, moose calves or even small mammals like squirrels. They are always hungry because they must eat up to 90 pounds of food per day in summer to stock up for the long winter hibernation period that can last up to six months, beginning when the first snow falls until late March or early April, when they wake up -- hungry again. It's Jane Starbird's turn: I am thinking about Grizzly Bears because I came back to California from Choteau, Montana a few weeks ago. There is some beautiful land at the base of the Sawtooth Range of the Rocky Mountains that is some of the very last Grizzly habitat in the lower forty eight states. I got to stay there at a guest ranch in a cabin owned by The Nature Conservancy. It's called the Pine Butte Guest Ranch and as a guest ranch, it has a history going back to 1938. Folks come there to learn about the place where the mountains meet the edge of the great plains. This is "Big Sky" country, the title of the book by A. B. Guthrie, who described it so well. He lived down the road from the Pine Butte Guest Ranch. His widow, Carol, comes to dinner every Saturday. So what do I mean by Grizzly habitat? Well, they need vast tracks of land as their domain and Montana has the wilderness areas that can meet bear needs. They need mountains for hibernating through the cold winters and they need the open space of the plains for their main occupation, which is eating. They travel vast areas digging up roots with their huge claws. They travel the riparian stream beds most of the year seeking tubers and berries and these stream beds are their highways out to the wide open space of the great plains. Try to imagine never having anything to ever fear. Grizzly bears are at the very top of the food chain. They are bigger and tougher than any other animal anywhere in North America. They can go anywhere they want, because they are so huge and strong and so fast that they can chase any other species away from any place they want to. Interestingly enough, the grizzly never has gone after cattle unless they are dead from a lightening strike, which isn't that uncommon. Of course, with the coming of humans to their part of the world things changed. They were no match for men with hunting rifles. Grizzlies have a silvery hair tip that gave them the name. Their long claws are always light in color. The black bear shares their range and is the common bear often sighted in all out national parks. 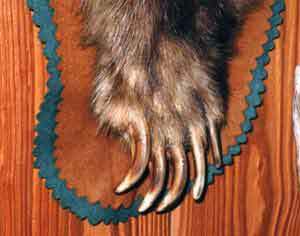 Black bears have smaller black claws about the size of dog claws, not four inches long like the grizzly. I could observe all this from the two bear skins hanging on the wall in the lodge at Pine Buttes. Mr. Grizzly likes to dine on dead cow it seems. One night we all jumped in the vans and drove to a neighbor's vast acreage to train our binoculars on the dead cow over yonder with hopes that we would see the bear that the breakfast cook at the resort had seen that very morning on her way to work. We didn't see him but it sure was fun to sneak out there in the dark looking for him. Being in Montana in September was a good time to see all the berries that both species of bear eat to add the fat to help them through the winter coming up. On every hike our guide pointed out the batches of either completely stripped bushes or very heavily laden shrubs. These are all perennial plants that survive the winters and all the berries that bears like to eat can also be eaten by humans. There was the Common Bearberry also known as kinnikinnick, Black Huckleberry, Bullaloberry or soopolalie, Thimbleberry, Choke Cherry, bristly Black Currant and also the rose hips of the Prickly Rose. So many berries growing everywhere -- very tempting for all the bears. We would stop and taste them under the watch of our guide. I know better than to taste without knowing if its safe. Usually whenever we came to a laden shrub on a hike we'd be looking over our shoulder to see if a bear planned on snacking there soon. Actually we did scare a black bear and her cub the morning a group of us hiked out a few miles from the resort. She was making a lot of noise grunting and snorting. The wind was blowing so strong she couldn't scent us and the noise eight hikers made was covered by the wind in the trees. I am a weekend-birder-kind-of-person here in California but I learned that to be in Montana in September was a time to be a bear-watcher-kind-of-person and I will look forward to my return next year to that wonderful place.